Senator Clinton will introduce legislation to end authority for the war in Iraq. SENATOR CLINTON: Madam President, I rise to join my colleague and friend, Senator Byrd, to announce our intention to introduce legislation which proposes that October 11, 2007 -- the five year anniversary of the original resolution authorizing the use of force in Iraq -- as the expiration date for that resolution. I believe this fall is the time to review the Iraq war authorization and to have a full national debate so the people can be heard. I supported the Byrd amendment on October 10, 2002, which would have limited the original authorization to one year and I believe a full reconsideration of the terms and conditions of that authorization is overdue. This bill would require the president to do just that. Now, assuming such a bad idea can get sufficient votes, she just has to convince President Bush to sign it. Then all we need is for our terrorist enemies to deauthorize the war they are waging against us. It sounds so easy. Also posted at Examining Presidential Politics. After voting against nationwide use of ethanol in gasoline last year, Senator Clinton today echoed President Bush's advanced energy initiative, calling for tax credits, private investment and new research in order to cut the consumption of foreign oil. According to the Associated Press, Clinton called for a massive expansion of corn-based ethanol, a corn-based fuel additive and substitute, a position sure to be more popular in Iowa, which holds the first caucus of the presidential campaign, than Hilary's vote against ethanol last year. President Bush has strongly supported ethanol. Under President Bush we have extended the 51-cent-per-gallon tax credit for ethanol suppliers; created a new 10-cent-per-gallon tax credit to provide extra help to small ethanol producers and farmers; provided about $85 million in loans or grants for ethanol business ventures; and signed into law a Renewable Fuels Standard that will nearly double the amount of ethanol in our fuel supply over the next six years. As result, the ethanol Industry is booming. Last year, America used a record 4 billion gallons of ethanol - more than double the level when the President took office. There are now 97 ethanol refineries in our country. Nine of those are expanding, and 35 more are under construction. 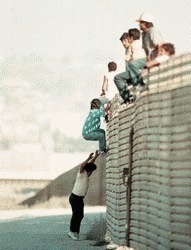 Senator Hillary Clinton told the New York Daily News she wants U.S. borders secured with a wall or fence. She favors a legalization process for the millions of illegal aliens already here. Clinton envisions a two-stage plan in which border security is beefed up, followed by legalization efforts in a year or two. "A physical structure is obviously important," the New York Democrat and possible presidential contender said. "A wall in certain areas would be appropriate," she said, endorsing a high-tech "smart fence" that could spot people approaching from 200 or 300 yards. Embracing both conservative and liberal goals, Clinton said she backs citizenship rather than amnesty for illegal immigrants, as long as it's "earned." At the same time, she welcomed tougher enforcement of federal laws punishing employers who hire illegal immigrants. Here is something the New York Senator and I can agree on, build a wall to secure the border first, then we can debate what to do with the 12 million illegals already here. 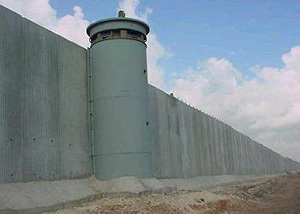 The wall should be substantial and effective, like Israel's 25 foot high wall, not one the illegal aliens have no problem crossing. Former German Chancellor Gerhard Schroeder, a founding member of "Axis of Weasels," endorses Hillary's not so stealthy presidential campaign. Should the "applause" be interpreted as a Saudi endorsement? You don't have to take it from us about Sen. Hillary Rodham Clinton 's desire to run for president. Her brothers, Hugh and Tony Rodham, say it's true. Friends tell us that the two are cheering Sis on and say she's making all the moves to get ready for the race--presuming she is re-elected by New Yorkers in 2006. Thanks to Taegan Goddard's Political Wire for the tip.